This 6-week course takes you step-by-step through the fundamental moves of Balboa. You'll learn the Downhold Basic, Uphold Basic, Ad Libs, Scoots, Paddles, Serpentines, Come Arounds, Lollies, Throw Outs & Returns, Outs & Ins, plus combinations and variations. You'll gain leading and following skills, and comfort dancing the Balboa through six weeks of instruction, drills, and practice. Learn to skillfully dance this course's material, and you'll be ready for the Intermediate Level at Balboa events worldwide! Balboa is currently the top dance craze in the swing-dance world, with weekends, competitions, workshops and events specifically devoted to Balboa springing up across the globe. Balboa is a fun, exciting yet relaxed, dancer's dance, with footwork, leading-following, and patterns that range from simple to intricate. The basics are easy to learn, yet the dance has enough depth and complexity so that dancers can progress and enjoy years of entertainment. Many songs you hear, not just at swing dances but out in the general public, are meant for balboa. PREREQUISITES: None. 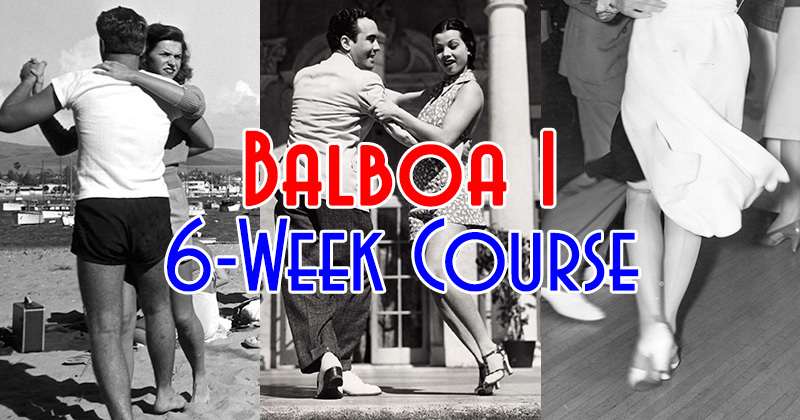 Whether you're new to Balboa or have taken many classes, try this course out — we'll get you comfortable dancing the Balboa. REGISTRATION: We encourage you to register in advance (no payment required). Click "register in advance" link, and you'll be taken to the Simone Salsa website. There, click "Register Here" link under Balboa 1. Then fill out the form and click the "Register" button. You can also register the first day of class at the studio, but please arrive early! WHAT TO BRING: Please bring or wear comfortable clothes, bottled water, and dance shoes. Shoes should allow you to pivot freely. Leather-bottom or suede-bottom shoes are best. For ladies, heels work great for Balboa (but are optional for this course).